As at yesterday, we told you about the upcoming Samsung Galaxy M2, mentioning that Samsung new M-series was limited only to the said M2, M3 and the Galaxy M5. However, information reaching us this morning has reveal that Sammy is got lot of smartphones under the M-series, and would start announcing them one after another starting from the last month of quarter 4, 2018. The information also mentioned the Samsung Galaxy M10 and the Galaxy M20. Surprisingly, the Galaxy M10 has just been revealed in a Geekbench record. 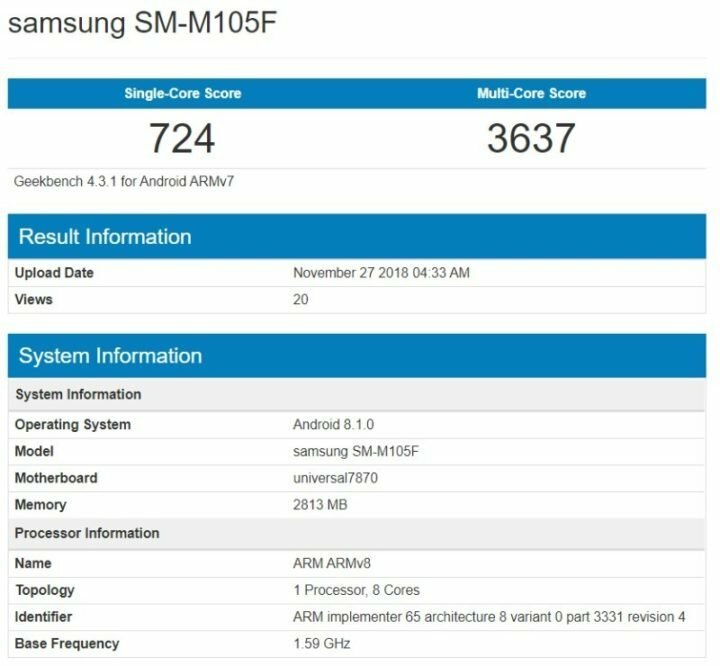 According to Geekbench, the Samsung Galaxy M10 will be midrange smartphone from Samsung, just like the Galaxy M2. The device appeared on Geekbench as Samsung SM-M105F, and runs on Samsung Exynos 7870 SoC, along with 3GB RAM and 32GB internal storage. According to the benchmark results, the Galaxy M10 scored 724 points in the single-core test and 3,637 points in the multi-core test. The CPU has been used in other Sammy midrange smartphones like the Samsung Galaxy J7 (2016), the Galaxy A6 (2018) and the Galaxy J6. The benchmark also revealed that the Samsung Galaxy M10 will run on Android 8.1 (Oreo) out of the box. Nothing was revealed concerning the display, so we don’t know whether the upcoming Samsung Infinity-O display will be used here. But more update will follow as soon as we see.